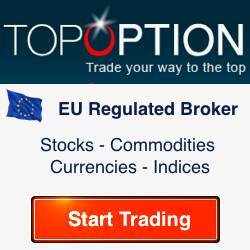 Topoption is a binary option broker that stands out though its ease of use and wide variety of ways to trade. The range of different binary options is equally impressive, with instruments available for trading in commodities, forex, indices and stocks. Another plus is the availability of a practice account - certainly not a given among binary options brokers - and the easy access to personal advice from a binary options expert, someting not unimportant for people who just start out in binary options. Aside from access to online educational content, beginning traders also have the option of 1 on 1 coaching. Deposit $200 and you will get a 50% welcome bonus of $100. A deposit of $500 gets you a 100% welcome bonus of $500. Bigger deposits will get bigger bonuses. The maximum binary options bonus at Topoption is $2,500. Aside from the ‘History Graph’, that shows you the price development of a product in a very clear way, Topoption also offers several features that enable you to tweak your influence on specific binary option trades. The Sell Option offers the possiblity to close a binar option trade up to an hour before the expiration time. And the Double Up allows you to double up on your position mid-trade when it looks like the trade is going your way. Another handy feature is the Roll Over, that allows you to increase the expiration time if you increase your investment by 30%. Also interesting is the feature where you can run different instruments against each other and the binary option trade is to speculate which one of those instruments will end higher at the experiation time. But the possibilities of this feature are still a bit limited and you can also only run instruments against each other that are strongly correlated with each other. Lastly, for the fast & furious traders among us there are the 60 second and Onetouch feature, for trades with an expiration time of only 1 minute and the ability of firing up a trade with just one click of a button. Fun, yes, suitable for everyone, no. 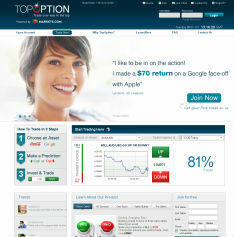 Topoption’s trading platform is web based and suitable for Windows and Apple. The screen presents a clear overview and is very user friendly. The ‘Pro Option’ in particular offers a clean, calm screen with a list of open positions underneath the main chart. Clicking the button ‘My Portfolio’ will show you all your open and closed positions. The button ‘Account History’ leads to an overview of all your deposits and withdrawals. Topoption’s customer support is very helpful and reachable by phone, email and live chat. Every trader is also given an account manager who is available for specific questions. On top of that, customers with a VIP account (required deposit of $5,000 or more) get access to a specialist who is also available outside regular trading hours. Topoption is part of the well-known forex broker Markets.com, regulated, among others, by CySEC, the British FCA, the Dutch AFM and the German BaFinn. Topoption is binary options broker that has clearly put a lot of thought into making trading in binary options as easy and user friendly as possible. The range of financial instruments available for trading on the web based trading platform is broad and diverse. We also like the feature where different financial instruments are paired against each other and would like to see more of these. But outside of that, the number of stocks, commodities, indices and forex products offered for binary options trading really is pretty impressive. We also see the fact that Topoption is well regulated as a definite pro, as well as the excellent customer support and the option of one-on-one coaching. Lastly, the welcome bonus is also nice and juicy, though this should in our opinion not be the only reason to start trading at a binary options broker.